This khoye ka paratha is certainly a unique Banaras ka khana as I had never heard of it till we shifted to Banaras in the mis 80s. The people of Banaras are so obsessed with mithai and khoya (evaporated, dehydrated milk) that they can have it all the time. There is a khoya gali in Banaras where only khoya is sold and it smells like khoya all over when you walk through that gali. I do not like khoya much and feel nauseating whenever I go there, but there are people who will come back with a kilo of khoya whenever they will pass through that area. No one can resist some khoya as it promises gujhias and khoye ka paratha apart from khoya matar ki subzi. Now that we don't get good khoya in Delhi I have started making it at home. The home made khoya has become my savior. The khoye ka paratha paratha recipe has nothing special except that it has a sweet filling and becomes a 'more than special breakfast' on a lazy morning. The khoya is roasted in a deep kadhai till light brownso it keeps well for some time in the fridge. Some prepared khoya helps making such treats instantly. Some sugar is added to taste if you like but we prefer it without the sugar. Some nuts and raisins are added and the mixture is used to stuff regular whole wheat dough to make parathas. Just stuff, roll and fry the paratha in ghee (nothing else will do). And be ready for some smiles. 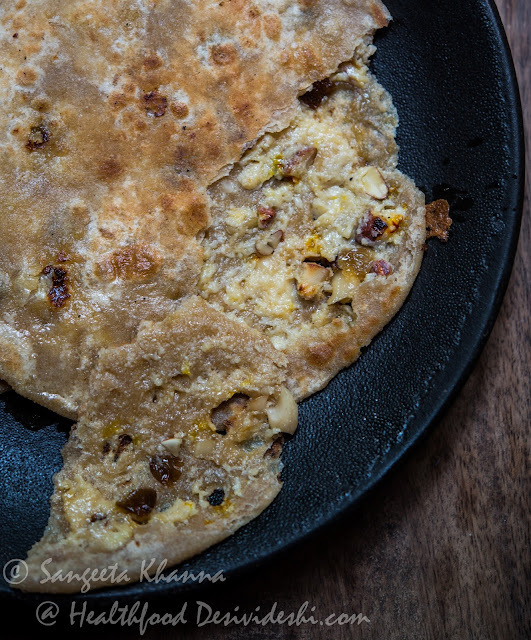 The raisins and the natural sweetness of the khoya is enough to sweeten this khoye ka paratha but you can add some crystal sugar if you like it really sweet. Enjoy a khoye ka paratha on a weekend morning and see how happy everyone around is. 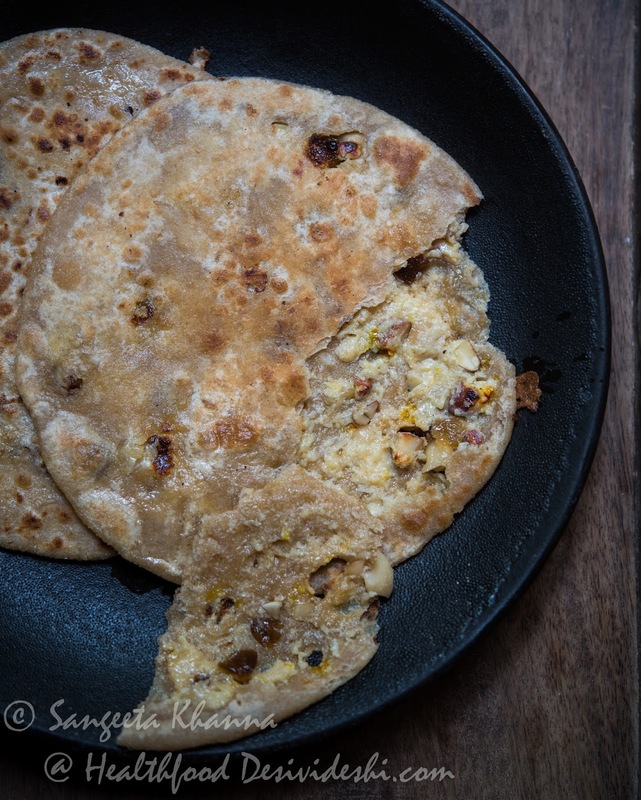 These parathas can become a dessert if the size of the paratha is smaller or the regular paratha is quartered and served like a wedge of khoya stuffed paratha. This is actually one of the few rare sweet things that I like myself. New to me, looks yummy. Very new to me...ur clicks are pulling me to try out soon..
wow....never have i tried khoya paratha! seems yummy! Very typically Banarasi. I used to love it. Now, at my age it is a bit heavy. But I can have wedge,can't I ?! !